MIAMI (30 de noviembre, 2018) – Desde que el dúo más icónico de la música latina vuelve a juntarse después de una pausa de cinco años, Wisin y Yandel no dejan de soprendernos: el mismo día en que arrancan con el primero de los ocho conciertos récord en el Coliseo de Puerto Rico, anuncian a fans que su nuevo álbum, Los Campeones del Pueblo / The Big Leagues, estará disponible a partir del 14 de diciembre y que está disponible para pre-orden o pre-preguardar en todas las plataformas digitales. Para pre-ordenarlo visite:http://smarturl.it/LCDP y reciba la nueva canción “Guaya” tan pronto como realices el pedido. También lo puedes pre-ordenar visitando Wisinyyandel.net. Los líderes de la música urbana latina anunciaron a principios de este año que se reunirían para ofrecer nueva música y el “Como Antes” Tour. Su primer show tuvo lugar en marzo en el Anfiteatro Altos de Chavón en la República Dominicana, en el mes de junio actuaron en un Madison Square Garden repleto, y esta semana y la próxima se presentarán ocho noches en el Coliseo de Puerto Rico, rompiendo el record de ventas de conciertos en dicha arena. Las fechas completas de la gira mundial se anunciarán a principios de 2019. MIAMI (November 30, 2018) – Latin music’s most iconic music duo is back together after a five-year hiatus andWisin & Yandel are already full of surprises – on the very same day that they kick off the first of eight record-breaking concerts at the Coliseo de Puerto Rico, they have announced that their new album Los Campeones del Pueblo / The Big Leagues will be released on December 14th and that it is available for pre-order or to pre-save on all digital platforms NOW. To pre-order or pre-save visit: http://smarturl.it/LCDP and receive brand new track “Guaya” as soon as you pre-order. You can also pre-order at Wisinyyandel.net. Los Campeones del Pueblo / The Big Leagues is the duo’s tenth studio album and the first one they have recorded together since the multi-award-winning album Lideres (released July 3, 2012). The artists wrote all of the songs alongside many of their longtime fellow songwriters including O’Neill, Gocho, Chris Jeday, Víctor Viera Moore and Eduardo Vargas Berrios, among others. Recorded in Cayey, Puerto Rico and Miami, Florida the new album also counts with collaborations with: Ozuna, Maluma, Bad Bunny, Miky Woods, Zion & Lennox, andFarruko. Following a five-year hiatus, Latin urban music icons Wisin & Yandel recently united for their “Como Antes” Tour and it didn’t take long for the duo to make history once again! In a record amount of time they sold out 8 shows at the prestigious Coliseo de Puerto Rico setting a brand new record for most consecutive shows held at the venue as well at the most shows performed there by any act since the inauguration of the venue, with a grand total of 25. The duo promise to make each show memorable and full of surprises which will include superstar guest artists. The entire island is abuzz with the excitement of the multiple sold outs and this has spilled over unto television newscasts and newspapers as well as social media generating much good will and a sense of pride with multiple expressions of support from fellow artists, industry executives and fans alike. They were honored yesterday in a presentation of banners commemorating their record setting concerts and ticket sales. “I am thrilled and so grateful to have the opportunity of breaking another record for the most consecutive shows at the Coliseo de Puerto Rico. Our Island has witnessed how much we have worked since 1998 to represent our country and it’s such a beautiful feeling to receive so much love and appreciation from all of them,” said Yandel. “We have worked very hard and sacrificed a lot, there have been good times and bad ones but when one sees the final result it has all been worth it because of our fans. Today we make history once again and we know that without God and the support of our fans, none of this would be possible. Thank you to Puerto Rico, thanks to our fans from all over the world. The leaders are back for as long as you decide,” expressed Wisin. Yandel and Wisin are beloved artists that have garnered non-stop hits in their solo careers, yet as Latin music dúo Wisin & Yandel they enjoyed unparalleled success, becoming the top selling Latin urban artists in the world, with their music and concerts. During their 14 year career as a duo, Wisin & Yandel received numerous multi-platinum certifications in the United States and Latin America and dozens of prestigious awards including a GRAMMY® and two Latin GRAMMYs®; as well as ten Billboard “Latin Airplay” #1s. 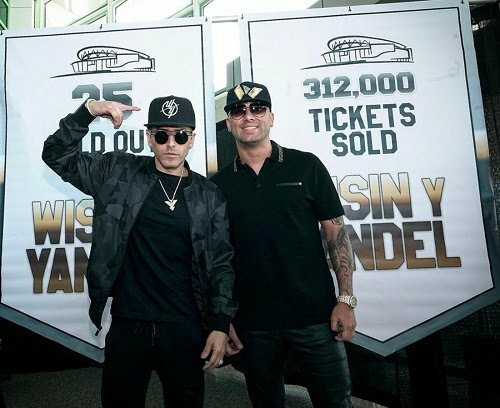 On tour, Wisin & Yandel have proven to be a force to be reckoned with, becoming the only artists in the Urban Latin Music genre to sell out both the Staples Center and Madison Square Garden in the US. Wisin & Yandel’s shows are nothing short of exhilarating. The duo travels with their 10 piece band, 8 dancers, and a state-of-the art audiovisual show; but the true stars, absolutely areWisin & Yandel and their unique brand of Latin urban music, a fusion of genres and styles delivered with a power and passion that no one in their musical genre can match. Most recently Wisin & Yandel united for three songs: “Como Antes” (Yandel featuring Wisin); “Todo Comienza en la Disco” (Wisin featuring Yandel and Daddy Yankee); and “Fiebre” (Ricky Martin Featuring Wisin & Yandel) and all three have reached #1 on the Billboard “Latin Airplay” chart. Their latest single “Reggaeton en lo Oscuro” is quickly soaring through the music charts and thriving on dance floors.